OK Go has collaborated with Sesame Street on Three Primary Colors, a fun stop-motion music video that shows kids the basics of color-mixing. The video was conceived and directed by Al Jarnow. 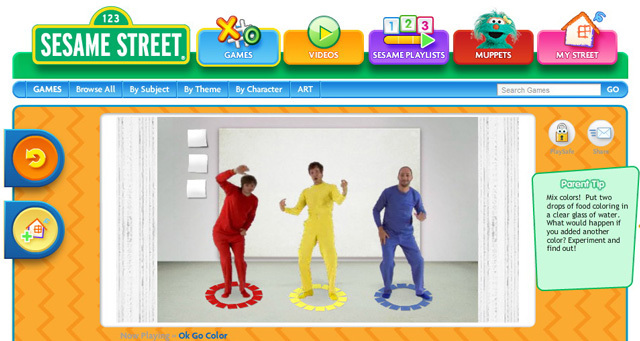 “a pioneer stop-motion animator who made numerous classic educational and experimental short films in the ’60s, ’70s, and ’80s for Sesame Street, Electric Company, 3-2-1 Contact, and other shows.” There is also OK Go Color, a web game collaboration between the band and Sesame Street. You may remember that OK Go did the remake of The Muppet Show Theme Song for Muppets: The Green Album.